If you aren't acquainted with good ol' Massachusetts, than you might not be aware that weather takes up 90% of our thoughts, and conversations. I wasn't fully aware of this until a few months ago when I was planning a short visit to LA, a city I hadn't been to since I was a child. I was conversing with my father, a long time resident, about my plans and he advised that when talking to the "locals"- weather really isn't a topic to be discussed. The reasoning was that the weather is almost always gorgeous so why bother talking about it? Massachusetts doesn't have the same curse. The weather can swing from beautiful to awful in 15 minutes here, and we love to complain discuss it. However, the last few weeks we have been getting a sneak peek into summer weather, warm temperatures, bright sunny skies, and it has been gorgeous. Now when the weather cranks up, I immediately begin to dream of delicious seafood. It's just the way my brain works- warm temps equals piles of oysters, shrimp and clams. That said, it should come as no surprise that when I received an invitation to check out the New England Seafood Market at Zephyr on the Charles in the Cambridge Hyatt, I immediately said yes. You might remember my last experience at a Hyatt. I had the very fortunate experience to check out their newest banquet menu, a constantly changing seasonal display of local produce, all fashioned in a dizzying, seasonal array. It was an evening that truly blew my expectations of "hotel food" out of the water. 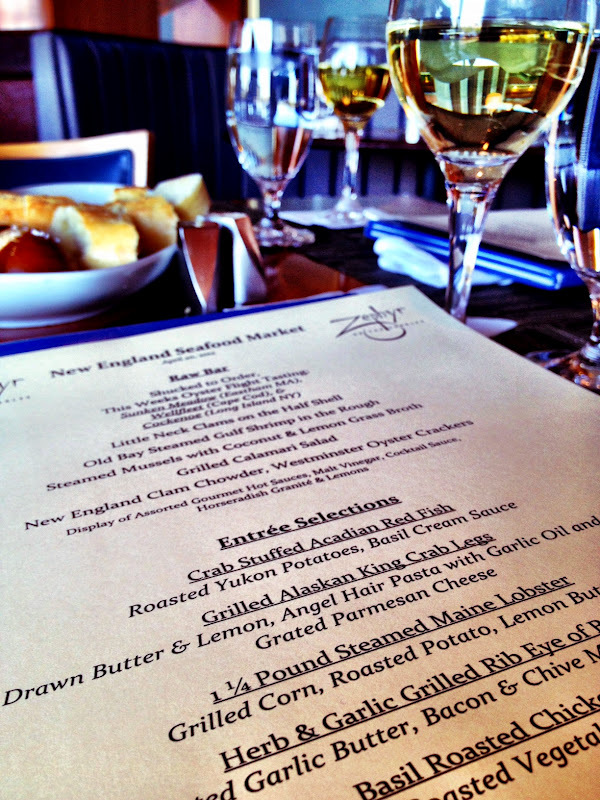 The New England Seafood Market at Zephyr is a Prix Fixe meal served only on Fridays that starts the diner off with an open run at their well stocked raw bar. Limitless trips to these tables that are chock full of freshly shucked oysters, Little Neck Clams, Peel n' Eat Shrimp, steamed mussels, calamari salad, and, of course, New England Clam Chowder. The night I attended I was able to indulge in oysters from Sunken Meadow in Eastham, MA (these sweet briny devils were my favorite of the night), the always popular Wellfleets from Cape Cod and the Cockenoe hailing from Long Island, NY. Along with these oysters was a vast array of accompaniments, fresh lemons and limes, malt vinegar, multiple cocktails sauces, horseradish, and many different types of hot sauce. Honestly- on a hot day, a perfectly chilled oyster enhanced with just a little sauce and slurped back in unceremonious fashion is one of life's little pleasures. I also relished the peel n' eat shrimp which were steamed in a healthy dose of Old Bay seasoning. One of my favorite girl friends hails from Atlanta and whenever I visit, peel n' eat shrimp has been on the menu. There is something just so satisfying about getting your hands on a warmed shrimp and using your hands to remove its shell just to get to the sweet meat inside. The addition of the Old Bay brings in that wonderfully herby savory note. These are a true favorite of mine, esp as they always bring me back to evenings spent in Hot-Lanta so I piled a few on my plate. The Hyatt did a fantastic job with them, using just enough seasoning and cooking them to bright pink perfection. This is a simple treasure and one that really can't be overlooked. Our server heartily exclaimed that the Steamed Mussels served in a Coconut and Lemon Grass broth were "life changing". Now when something receives that high of an endorsement- I try them. Mussels, as much as I love their own unique savory flavor, tend to really be all about the broth that is served with them. I'm not sure if its their small size or their delicate flavor, they serve as a dainty vehicle for delicious broths and sauces. The Hyatt created a wonderful, Asian inspired flavor profile here with their coconut milk and lemon grass combination. The coconut milk of course creamy and rich and then paired with the light citrus flavor of the lemon grass the result was truly lovely. Finally, I found that I couldn't resist a small bowl of their New England Clam Chowder. Clam Chowder, especially in these parts, is highly subjective. Every person I've spoken to finds different elements to the chowder to be important. The Hyatt's version was thin, plentiful with their chunks of clam and potato and had a deep smokey bacon flavor. Due to the amount of debate out there concerning clam chowder I can say this much- this was not my favorite version of chowder. I prefer mine to be thick and creamy, with more of a flavor of the sea and fresh herbs than predominantly bacon. 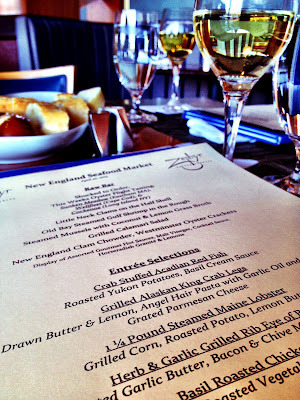 The New England Seafood Market, after the Raw Bar excitement, also comes with an entree and dessert. The entree selections have a great range of both surf and turf options and the night we dined we were able to choose from a list of about five different entrees. I wasted very little time reading through the list as my eyes were immediately drawn to the one I wanted- 1 1/4 pound steamed Maine Lobster. Served with the traditional accompaniments of grilled corn, roasted potatoes and a wonderful lemon drawn butter- I couldn't imagine straying from this classic choice. Now it has been eons since I have sat down to a whole lobster. Honestly I cannot remember the last time I donned a bib, armed myself with claw crackers and went to town on a lobster-but man I will say it felt great to do it again. Succulent meat filled the lobsters claws, legs and tail, and every dunk into the citrusy butter made me long to hear the waves crashing at an ocean side stop. The accompanying corn and potatoes, though vastly overshadowed by my highly interactive meal were well cooked and seasoned, but I can't say they received a lot of my attention sadly. Finally I ended my meal with their Roasted Pear Tart served with a Honey Ginger Syrup. The tart was made from a really well put together patee sucre crust, dense and sweet, perfect to hold the roasted pears. I love the use of this simple crust, it adds more flavor than a typical pie crust, and I feel it holds up well to fruits that aren't super sweet on their own. It adds a bit more luxury to the tart. The real joy here was the honey ginger syrup which had the perfect blend of true, natural honey flavor and the gentle spice of the ginger. It was a lovely end to the meal. The New England Seafood Market at the Hyatt Cambridge can be found on Friday evenings, and is available for $43.00 inclusive of the Raw Bar, an entree selection and dessert. 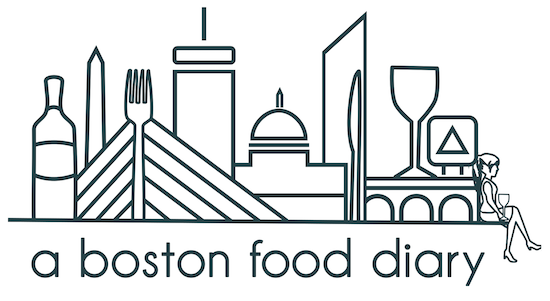 Once again, the Hyatt chain bunked the idea of "corporate" hotel food and delivered on a truly regional experience bringing the flavors of New England together with some classics from other parts of the world and working to source their ingredients from local suppliers. 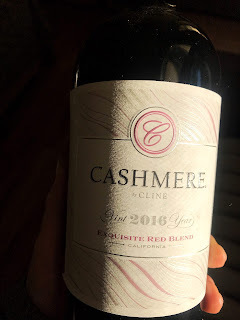 The combination resulted in deep flavors, undeniable freshness and a wonderful look at our part of the country here for both visitors and locals a like. I must also thank my wonderful companions for the evening who served to be incredible company during the meal- the great Will from The Boston Foodie, and the wonderful Brian from The Gringo Chapin. Sounds like a great meal. I might have to take Hubby there sometime. He loves all seafood, especially lobster! Wow, this looks like an incredible meal! The weather really is an important thing here in Boston! All of that seafood looks like PERFECT warm weather food!